Former Southampton and Tottenham boss Harry Redknapp believes footballers are too distracted by technology. 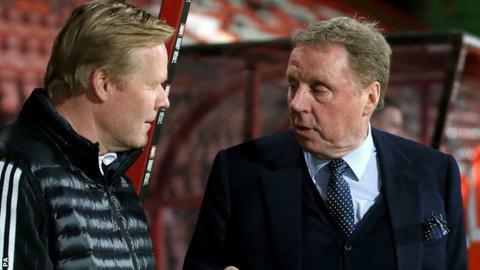 The Derby County football advisor agreed with comments from Southampton boss Ronald Koeman that lifestyle changes mean players talk less. Koeman revealed he holds communication sessions, focused on how social media, mobile phones and headphones put players "in their own world." "There's not the communication there used to be," said Redknapp, 69. Redknapp, who has also managed West Ham, Portsmouth, Bournemouth and QPR, told BBC Radio 5 live: "You don't hear people go round and talk to each other. It doesn't happen. They sit with their headphones on. "People like John Terry and Tony Adams, who will boss people and talk and organise, these people are very few and far between now." Redknapp was a midfielder for West Ham and Bournemouth, among others, during a playing career that lasted between 1965 and 1982 and took in almost 300 games. "We used to get on the coach and talk about football. There was no television in those days and we certainly didn't have headphones or computers to play games," he said. "We spoke about the game - the game coming up and the one we just played. It is very different now, I'm afraid. "The only chance you have really got to speak to them now is on the training ground." Koeman, whose team are seventh in the Premier League, has this week revealed how he was sending his players to weekly communication sessions to get them talking to each other again. The 53-year-old, a former Dutch international and member of Johan Cruyff's "Dream Team" at Barcelona, spoke of how things were different before the advent of smartphones, when team-mates on long coach journeys interacted with each other more. He said: "One of the problems you see now in football is there is not enough communication on the pitch. That's all about social media. Everybody goes on it straight away on their phones. "That is maybe one of the reasons they don't talk any more on the pitch. Communication on the pitch is so important even if it is just to help your team-mates and say 'time' or 'turn'. "That's so difficult now. To deal with this we do sessions in training, different exercises every week which are all about focus, communication and concentration." Redknapp, who has agreed to manage Jordan for their next two World Cup qualifiers, said that banning players from wearing headphones is one option to help improve communication. He added: "When I was at Tottenham I was giving a team meeting at 2pm at West Brom. I noticed a player in the corner with his headphones on. I couldn't tell you what I said to him. I couldn't repeat it."